Tis the season of giving and goodwill. It is a time to reflect on the magic and spirit of Christmas. With his jolly exhuberant laugh, vibrant red suit and beard of white, Santa Clause is a reminder of that excitement of Christmas morning. We were able to witness the magic of santa firsthand here at The Address. Take a minute to picture this scene.... Santa, dressed to the nines and smelling of fresh baked chocolate chip cookies, walks down the corridor between the shops, stopping every few seconds to say hello to a smiling face or a child in a stroller with a look of disbelief in their eyes. Once he reaches his destination, a heaping pile of snow glittered with children on boogeyboard-sleds and gathering snow balls, all heads turn to the man in red. At that moment a dozen or so kids take off running over and around the snow pile in hopes of reaching Santa first. He takes a few moments with each child, listening to them articulately recite their Christmas wish lists. Parents rush over as well in hopes of obtaining a picture of their child excitedly speaking with Santa. As the last child finishes up telling Santa his wish, want and desire list, he stands tall to make sure there was not a child overlooked. 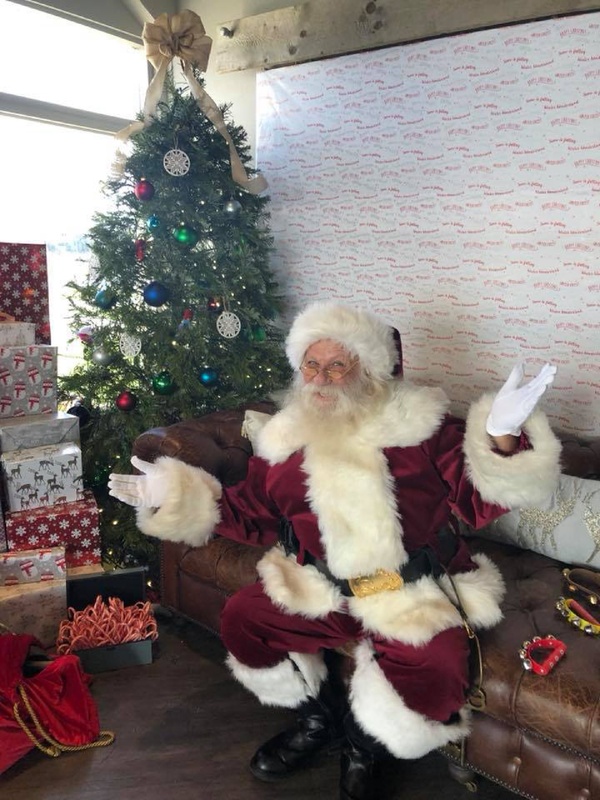 Out of the corner of our eyes, we see a boy about 10 years old who by the look in his eyes, believes without a doubt in his mind that this Santa is the real deal here to make sure that he knows what each boy and girl wants for Christmas. From the smile on his face to the gleam in his eyes to the hurried pace of his walk, this boy was certaily a believer. When he reached Santa, his arms opened wide and he flew into the embrace that Santa provided. 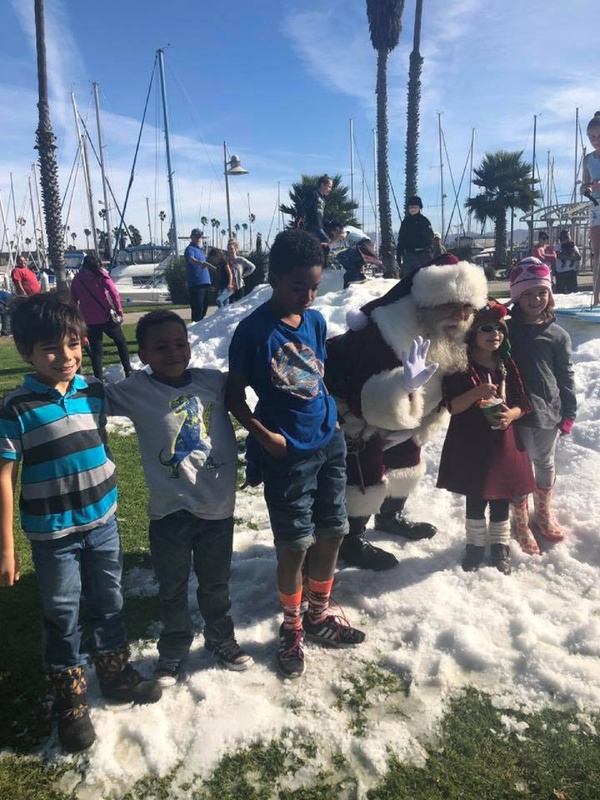 We all stood in awe at the sheer joy that the mere presence of Santa Clause brought this child, and all children alike. Tears of happiness filled each of our eyes and we witnessed this magic. Even Santa was not immune to the power of this childs' enthusiasm. The day pressed on and Santa's belly was beginning to run on empty. We headed off to Pacific Corinthians Yacht Club for some lunch. - Side note: glancing up and seeing Santa Clause in your rearview mirror is actually quite shocking. 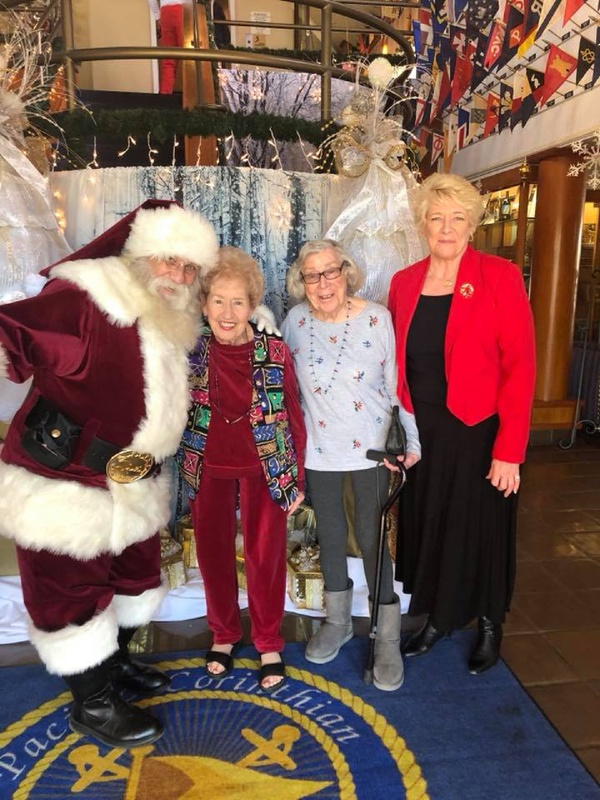 - While we were receiving our Guest name badges, Santa was once again wooing all those who walked through the lobby, young and old. One particular little older lady caught Santa's eye and he headed straight over to her to have a chat. He greated her with a smile and a friendly hello hug. Once she realized that this was no ordinary Santa, her eyes lit up just as the boys' did before her.